Hurricane Florence came ashore along the North Carolina coast on September 14, 2018, bringing Category 1 force winds and substantial amounts of rain and storm surge. One of the areas affected by the storm was the United States Marine Corps’ Camp Lejeune, which suffered infrastructure and waterway damage. Camp Lejeune is home to the Second Marine Division, multiple training commands, and the U.S. Coast Guard’s Special Missions Training Center (SMTC). The Coast Guard uses the waters around the camp for small boat tactics training. 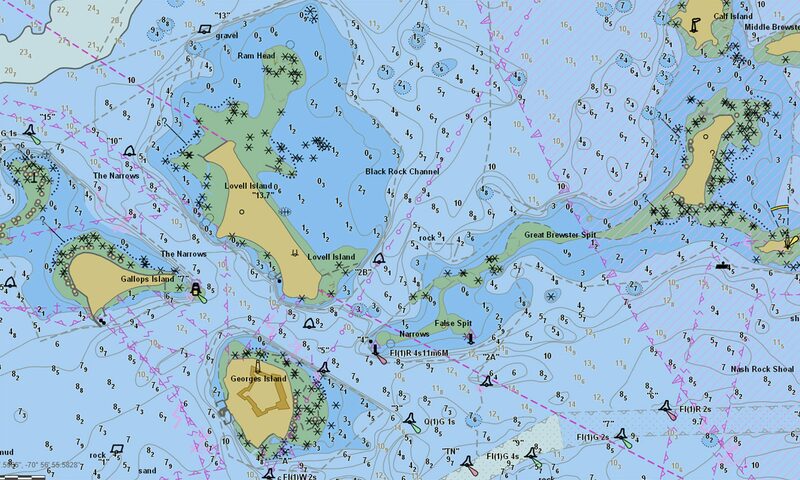 The SMTC submitted a request to the Office of Coast Survey in late October to investigate their training area for hazards to navigation. Ahead of the response, Lt. j.g. Patrick Debroisse, junior officer in charge of NOAA Research Vessel Bay Hydro II, traveled to Camp Lejeune to meet with the Coast Guard’s Boat Tactics Branch to understand the issues for the school, and to provide planning and logistical support. Lt. j.g. Debroisse and BMC Rootz collect and access data in the Coast Guard’s training area at Camp Lejeune. With the knowledge gained from the Boat Tactics Branch, Coast Survey deployed a team of hydrographers to Camp Lejeune to survey and help the Coast Guard gain confidence in commencing high speed tactical training again. The team, including Lt. j.g. Debroisse, Robb Mowery (Bay Hydro II), Alex Ligon (NRT-Stennis), Josh Bergeron (NRT-Stennis), and Lt. j.g. Dylan Kosten (NRT-New London), used the mobile integrated survey team (MIST) equipment and surveyed from Coast Guard training vessels. Robb Mowery processes data in the Coast Guard training area at Camp Lejeune, North Carolina. Josh Bergeron installs the MIST kit on to a Coast Guard 25-foot training vessel. Using side scan sonar along with single beam and multibeam systems, the team collected data in search of underwater hazards as well as soundings to update NOAA’s nautical charts. Much of the survey data in the area was acquired prior to 1940 using partial bottom coverage methods. This survey will not only serve to increase Marine Corps and Coast Guard’s confidence to conduct training in these areas, but also update the nautical charts for military assets and local fishermen using these waters. A local fishing vessel operating in the Coast Guard training area.